I once wrote a letter to my anxiety. It was a letter that said "I hate you" and "I'm done with you" in so many words. I was breaking up with my anxiety, while knowing I can't always prevent it from latching on to me. I was so angry at my anxiety. I was angry for its inconvenience, its power over me. I still feel that way sometimes. Recently I have formed a better understanding of my anxiety. I can not be angry with it, because it is trying to keep me safe. Safe. It is a word I always knew, but did not understand when it was used toward my mental health. At 17 I would sit in my therapist's office and she would say, "do you believe you can keep yourself safe?" I knew what that meant, but for some reason the question seemed different for me when asked "do you feel safe?" Safe? What does that mean? As a child that means not touching the hot stove, not leaving with a stranger, or "stop, drop and roll" if fire catches your clothes. Do I feel safe? Or, do I know I am safe? Are those asking the same thing? No, I don't believe they are. If I understood that back then, I would have answered, "I know I am safe, but sometimes it doesn't feel like I am and I don't know why." That my friend, is the door for anxiety to enter. I was telling myself, telling the world, and telling my anxiety, "I AM SAFE! WHAT ARE YOU DOING?" My constant battle was living that speech, but not being able to convince my body it was true. I experienced childhood trauma. I only started working through it these past few years. Before that, I did not really understand where my anxiety stemmed from. I saw it as my low self-esteem, my childhood social anxieties "catching up with me." So when I hit a dark place I almost convinced myself it was supposed to be this way. I saw my anxiety as "who I am." Earlier last month I returned from Hawaii. I had been living in paradise for 2 months where I felt at my absolute best. 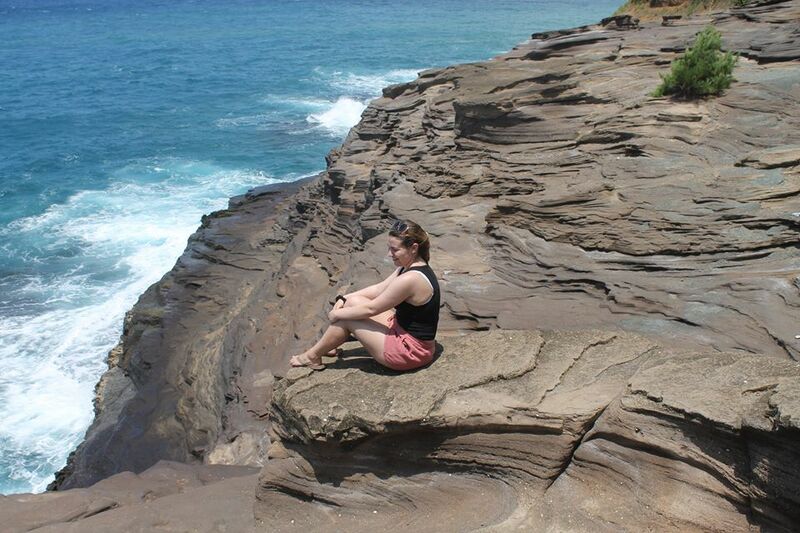 In Hawaii, I worked to heal so many past wounds. I felt safe to do so. Being in paradise seemed to have captured my anxieties, and allowed me to take a peaceful time-away to focus on the work I have left to do for myself. When I returned home, I had no idea how hard it was going to be. Now, I am not even talking about jet lag. Everything went out of wack. Digestive issues, sleep problems, panic attacks, and so much anxiety. I was frustrated. I had the best 2 months of my life. I was happy, I was healthy. My anxiety, my depression seemed to have disappeared and allowed me to see the real ME. I wanted to be happy at home. I wanted that feeling to continue. My anxiety wasn't returning to pester me, it was returning to warn me. I guess it took traveling alone across the country to show me how I can feel, who I can be, when I feel safe. With that, came confidence, creativity, and a happiness I can not explain. I just knew, this, this is who I am meant to be. This is who I am. My body went into shock when I returned home. Home can be a "home sweet home" for so many. For me, I recognized it to be a reminder of the trauma in my past. With that, all of the emotions came with it. It was a reminder that I have more work to do. It is a reminder that I am in need of the freedom and independence I so desire. It was a painful reminder that I have not felt safe here, but I can feel safe. It is possible. Lastly, it was an encouraging reminder that I am worthy of the distance I desire. Anxiety's timing does not always make sense, but it is trying to protect us. It is our job to find ways to stay grounded, to help heal and retrain our body to trust safety. I often fear the past repeating itself. I have to center myself in this moment, by asking myself to list all the ways the person I am today is different from who I was then. Sometimes I need support to remind me of those steps and leaps I have taken. But in the end, the list is always longer than I remembered it to be. And I am always a step closer to feeling safe within myself.